Child Care Services Association (CCSA) celebrates 45 years of service for North Carolina’s youngest children! 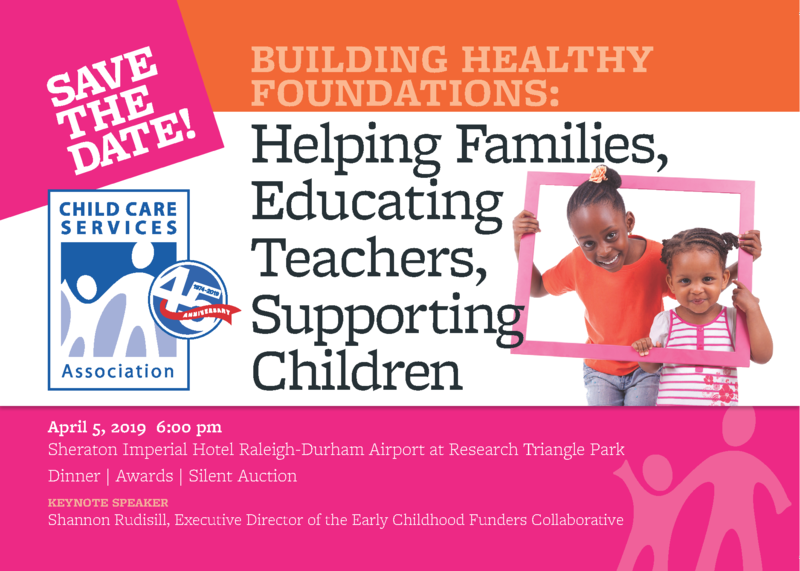 Join CCSA and Durham’s Partnership for Children (DPFC) Friday April 5th, 2019 at 6:00PM for the 45th Anniversary Celebration of CCSA. There will be dinner, awards and a silent auction held at the Sheraton Imperial Hotel in Research Triangle Park. DPFC along with many other leaders in early education work alongside CCSA to support the young children of Durham. Founded in 1974, Child Care Services Association’s mission is to ensure affordable, accessible, high-quality child care for all young children and their families. Using a holistic approach, CCSA supports children and families, provides free referral services to families seeking child care, helps child care professionals improve the quality of early education children receive and ensures that all families can afford and access the high-quality early care and education that is so important for a child’s early development. Through its Meal Services Program, CCSA also provides nutritious meals to children at child care centers, where they may eat 50-100% of their meals. Our T.E.A.C.H. Early Childhood®, Child Care WAGE$® and Infant-Toddler Educator AWARD$® programs give child care professionals the means to obtain an education and supplement their salary based on that education. CCSA also licenses T.E.A.C.H. and WAGE$ across the U.S. and conducts early childhood systems research and policy development statewide and nationally.